July 15th in Premium Themes by Wordpress Jedi . Twitter is one of the hottest sites on the Internet these days. Millions of people from around the world come to the site to share their thoughts in form of messages as lengthy as 140 characters. While Twitter can be a whole lot o fun to be a part of, you do have the option to start a similar type of website using WordPress as long as you choose the right theme. 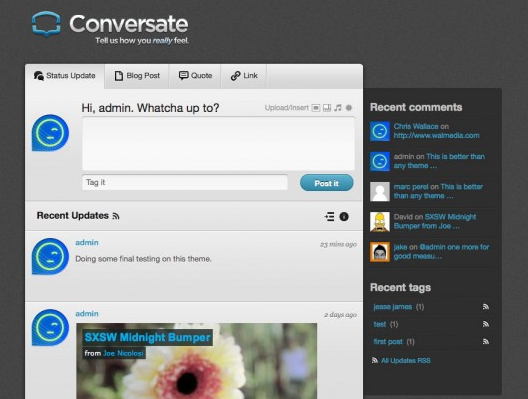 Conversate for WordPress is one of those themes that lets you do just that. It’s an innovative Ajaxified template that supports inline posting and commenting, giving your visitors a similar experience to Twitter. Conversate comes with 5 different color schemes (Blue, Green, Red, Orange, and Aquamarine). You can easily change your background or upload your own logo (if you intend to brand your website). The theme is Ajaxified, which means your page does not refresh every-time someone posts something. Users are not limited to text comments. They can post video, mp3, and all kind of things to your wall. Inline commenting is supported too. The keyboard short-cuts are a huge plus. 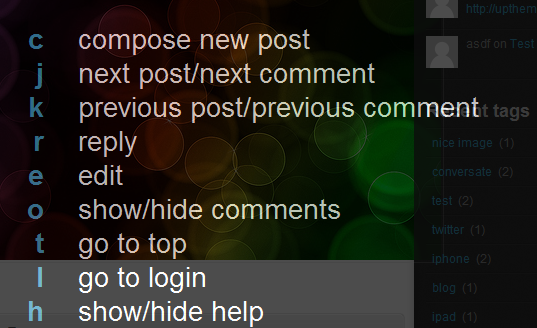 They make it so much easier to navigate through this theme, edit, and posts new messages. This theme has a built-in iPhone style-sheet, making it much easier to work with on an iPhone. 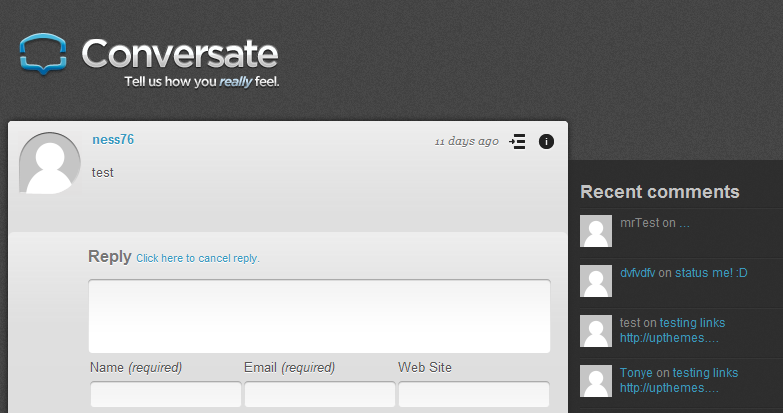 Conversate for WordPress is pretty clean and easy to customize. It is not going to clone Twitter or replace it for you. But it is a unique theme for your unique projects.